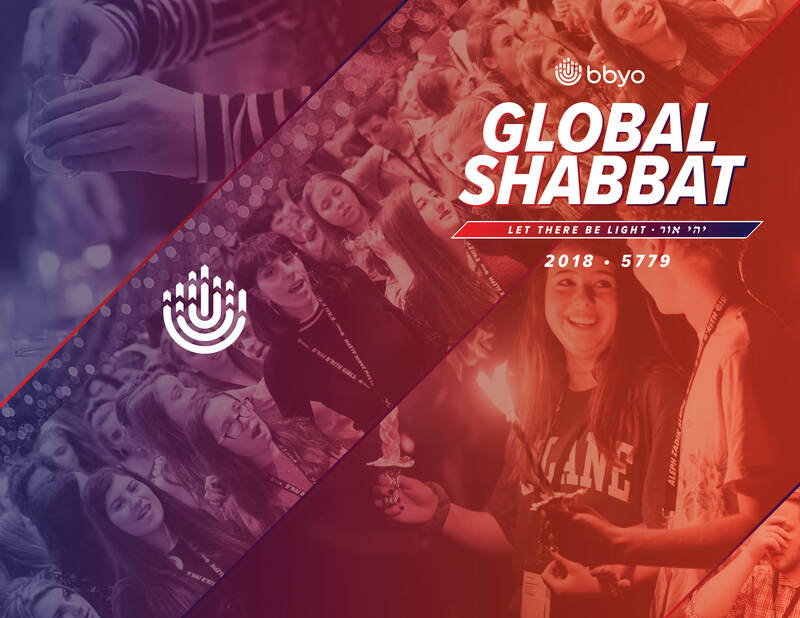 This December, thousands of Jewish teens around the world celebrated Global Shabbat—BBYO’s biggest Shabbat experience yet. 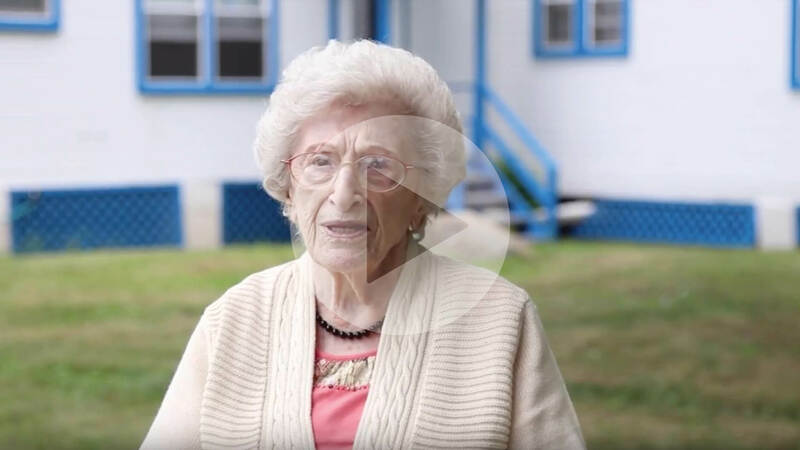 Each year, Holocaust survivors, business professionals, faith leaders, cross-cultural activists, politicians, and entrepreneurs join with Alephs and BBGs worldwide to share inspiring stories and take part in a meaningful, teen-led Shabbat experience. 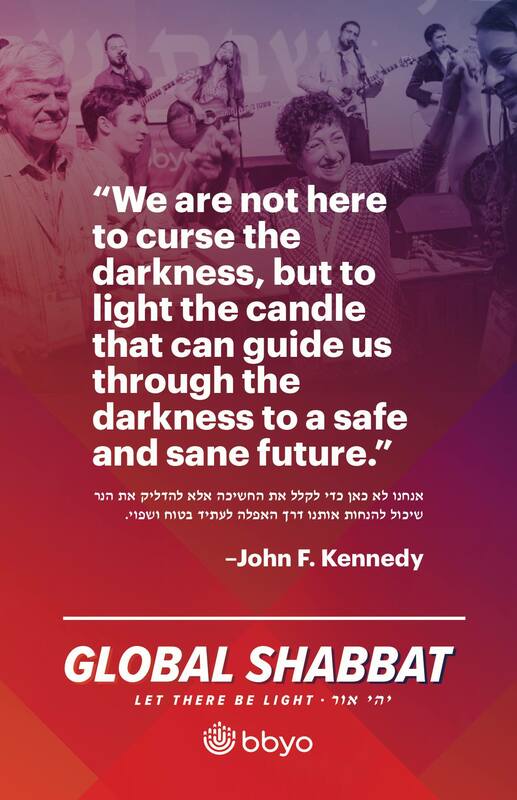 This year’s Global Shabbat program theme, “Let There Be Light,” will be embraced and elevated around the world through a diverse array of thoughtful programming designed to bring the community together around the lights of Shabbat. 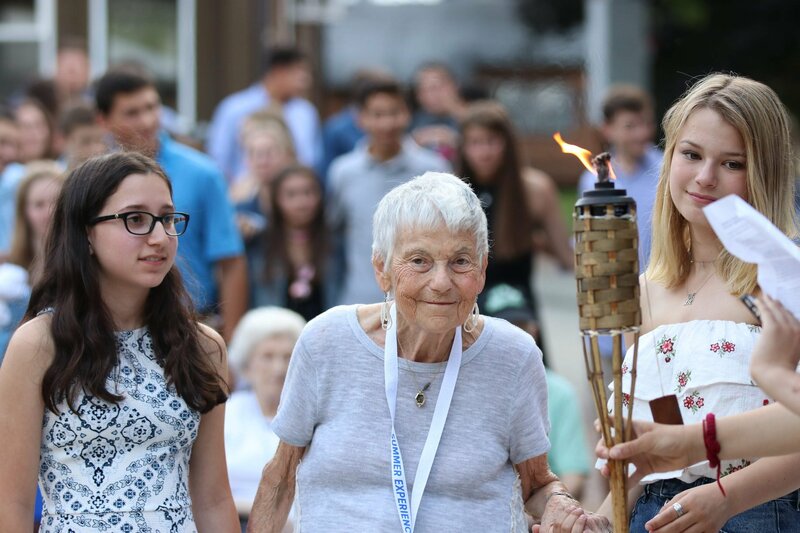 This year's theme was Let There Be Light, which draws inspiration from the quote by the celebrated Jewish author, Noble Laureate, and Holocaust survivor, Elie Wiesel: "Even in darkness it is possible to create light." 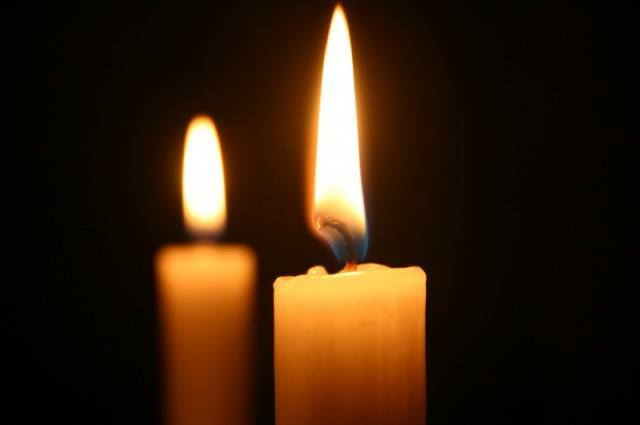 Let's bring light and love to all people everywhere through Global Shabbat and beyond. 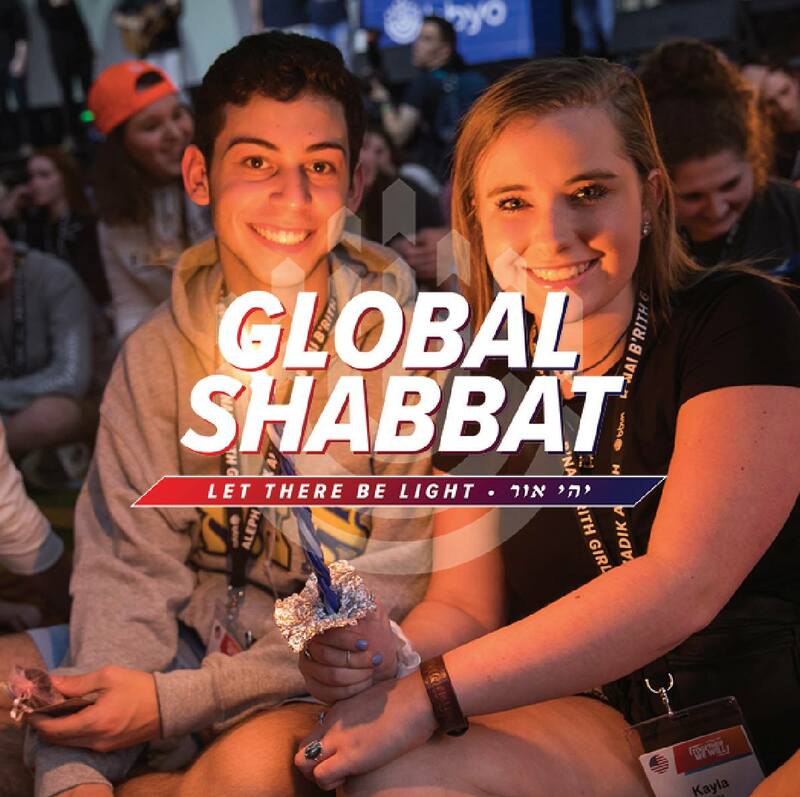 Learn about our inspiration for this theme by watching a recap of Shabbat to Remember from International Kallah 2018. 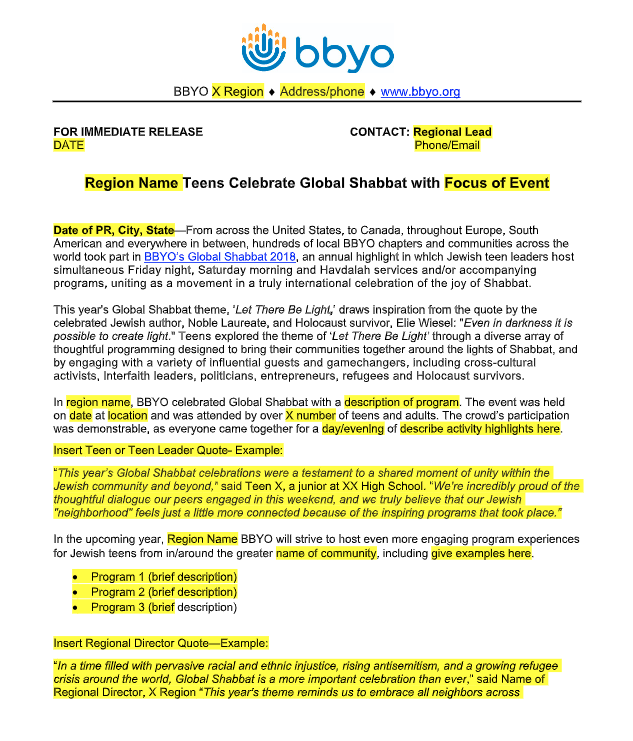 Check out some of the amazing guests and partners who participated in BBYO's Global Shabbat 2018 worldwide. Last year, we brought the community together like never before. 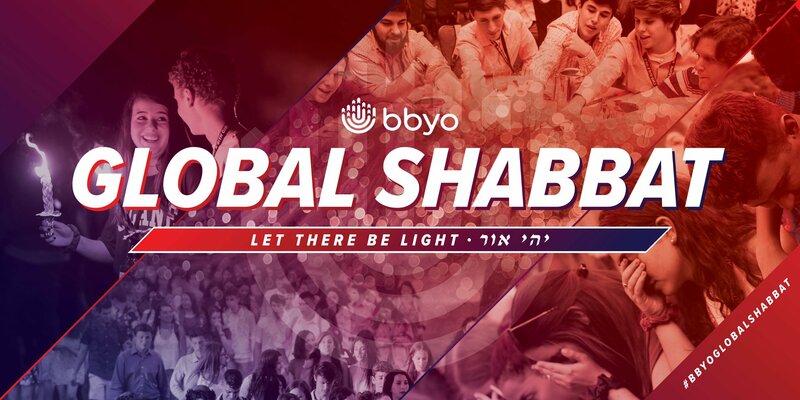 More than 500 local BBYO chapters in 20 countries participated in Global Shabbat. 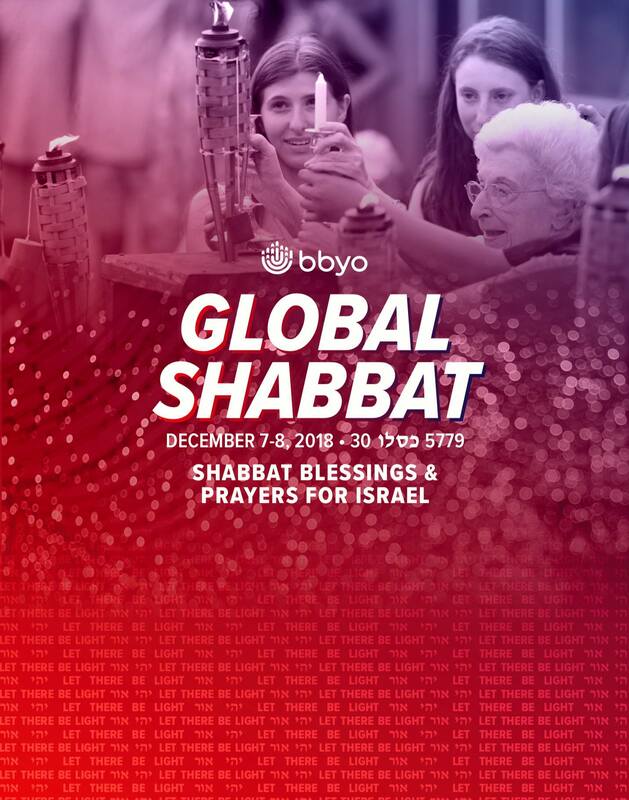 Global Shabbat events popped up all over the world. 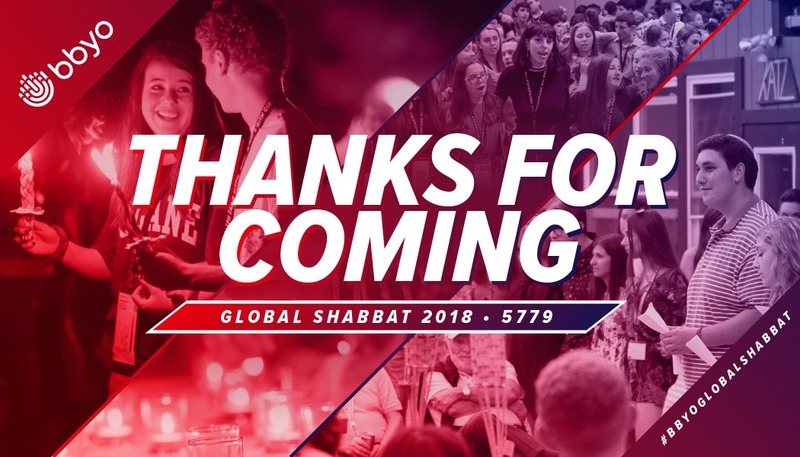 Check out some of the incredible experiences from Global Shabbat 2018. 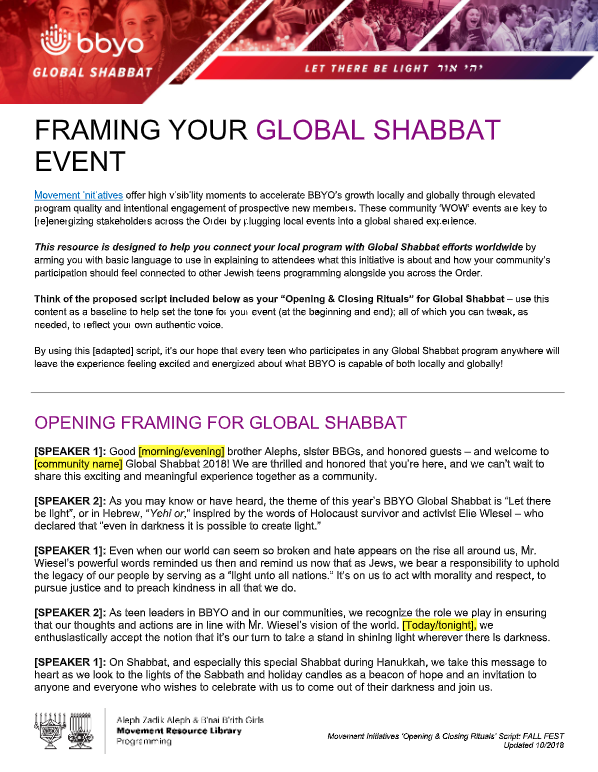 Making meaningful moments for Global Shabbat will require some planning. Take a look through the questions and resources listed below to spark ideas and ensure you didn't forget anything. 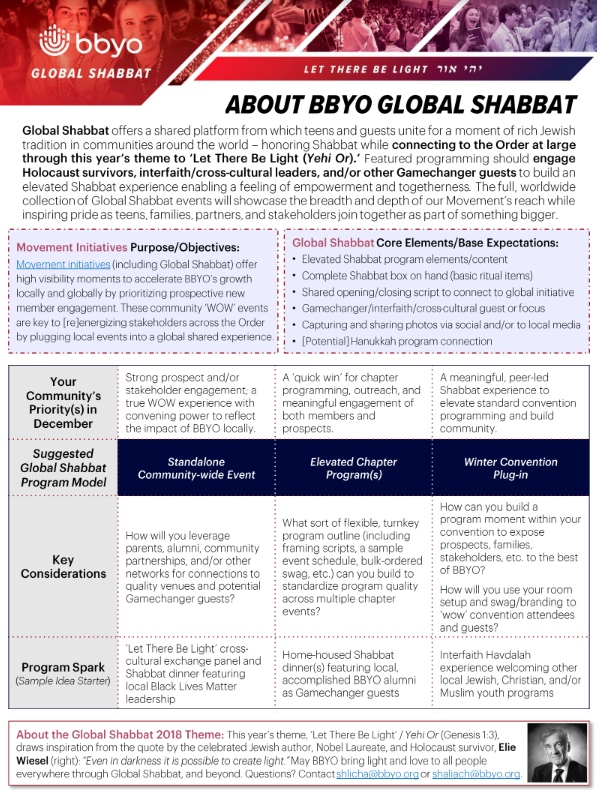 If you're new to Global Shabbat, be sure to read over this Global Shabbat one-pager, which will provide context about the purpose of the initiative and what events have looked like in the past. If you still have questions after reading through the steps, that's totally cool. 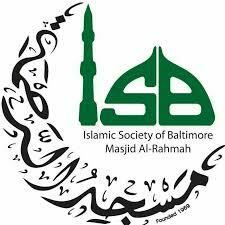 Feel free to contact your International Sh'lichim for planning support. Don't worry, we've got your back. Before you dive into the planning process, be sure to learn what's important to the success of your event. Review the goals and parameters of the initiative you're working toward, and understand key opportunities for innovation to elevate your experience from good to WOW. How can you maximize creativity and innovation in working toward stated goals? How can this effort be layered into your programming calendar to enhance your funnels? What does success look like for this experience (including metrics tied to program engagement, quality, innovation/risk, etc.)? How will achieve that success? 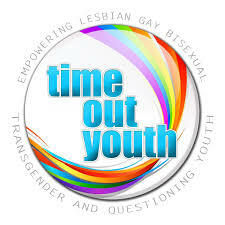 Once you clearly understand the task at hand, IDEATE together with teen and staff leadership to build a unique experience that will best serve your community's needs within the context of the initiative. Do a community mapping exercise, clarify key responsibilities, and establish ambitious (and attainable!) goals. What are the unique opportunities (and challenges) afforded by your community - including people, places, experiences, etc. - and how can you take full advantage of them to elevate your event? 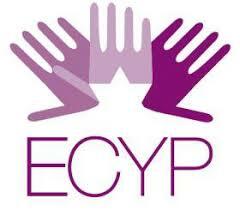 What responsibilities are key to the success of this experience, and how will you divide the work (among specific teens and staff) to define expectations and share the load, while also leveraging individual skills? What specific, measurable, achievable, relevant, and time-bound goals will enable you achieve your stated objectives to maximize success? With a clear vision to guide you, take time to STRATEGIZE everything you'll need to enable success. Solidify basic logistics, design your program budget, seek out partnerships, outline a clear marketing strategy and swag, designs, all while further elevating your program plan to produce a truly 'high res' experience. What are the key Who, What, When, Where and Why components of your event? What program plan will you use to drive progress toward your desired outcomes? How will you push your event concept beyond the status quo to build an experience that is as inclusive as possible and that will defy all expectations? How can you get creative to maximize your experience while minimizing dollars required? Where might you apply for additional funding to go above and beyond for your program? Considering the nature of your event, what local/national organizations can you engage as community, program, and/or brand partners? How can you leverage parents, alumni, and other stakeholders to help? What steps are required to turn your program idea into a reality? What tasks and support are needed to make that happen, and along what timeline? How will you leverage your network using all available communication channels to promote your event far and wide? Who will own each touchpoint, and along what timeline? What relevant, sophisticated, and desirable swag will you offer before/during/after your event to surprise and delight your guests? 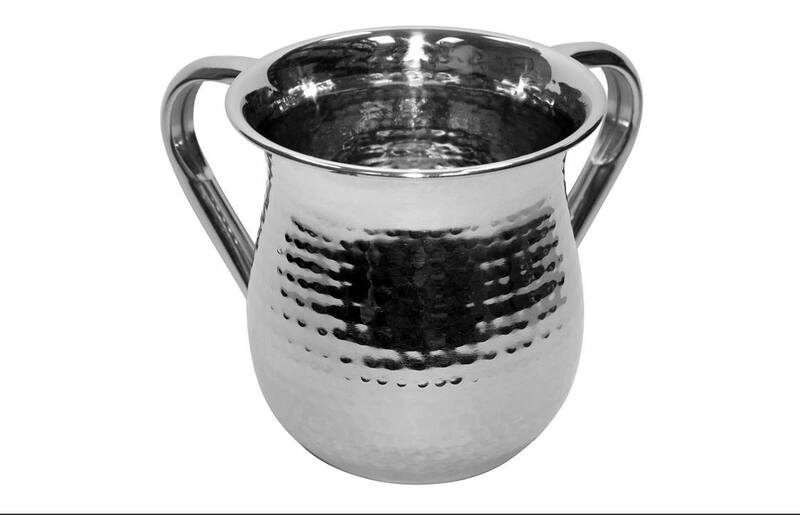 Where are there opportunities to bulk order items to keep costs low? Good things come to those who HUSTLE. Use branded templates and an all-in approach to promote your event early and often. Create smart online systems to stramline registration. Dig deeper to recruit more teens across all social circles, and make sure the press (and the Order!) hear about what you have planned. How can you leverage (and customize) available promotional items to build major buzz about your event through a variety of digital, print, and live sharing platforms? 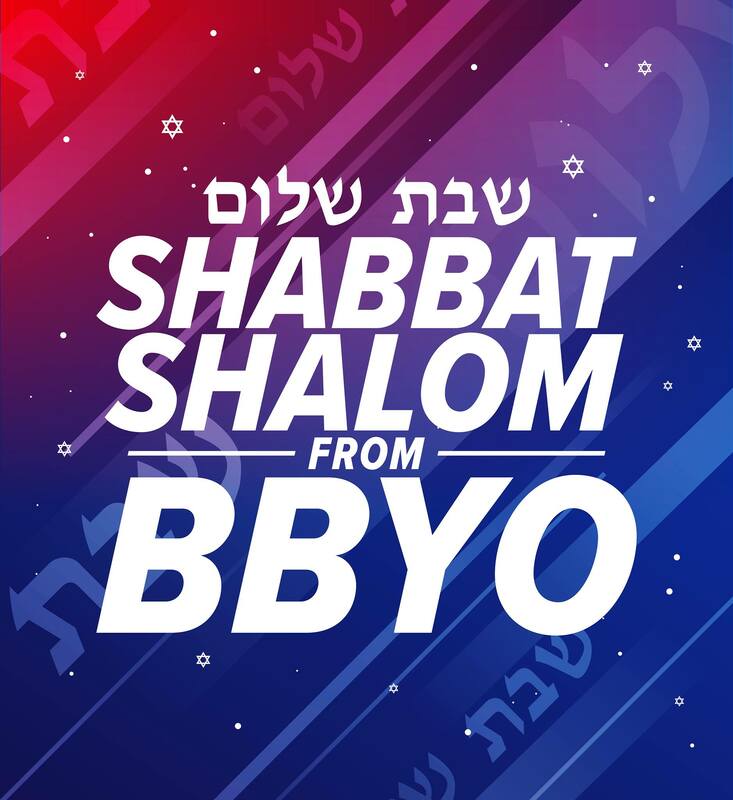 How will you use BBYO's online registration portal to promote your event and encourage pre-registration for planning purposes? What other fun information could you collect to inform surprise-and-delight opportunities? How can you activate your recruitment plan in a way that builds real FOMO among your target audience, and what exciting incentives can you offer to encourage hustling toward pre-registration? 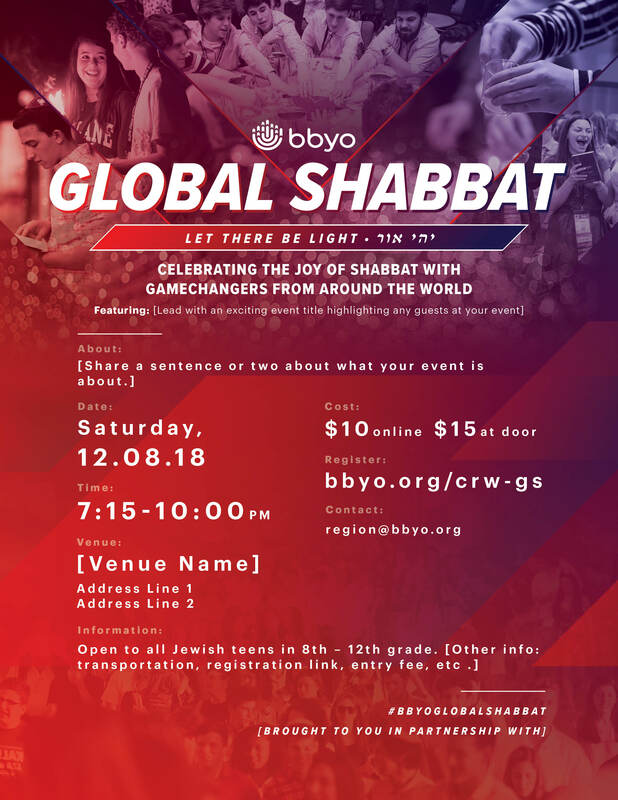 How can you pitch the community impact of your event (to elevate BBYO's brand) in a way that will attract local/national media to take note and either attend or cover the experience? 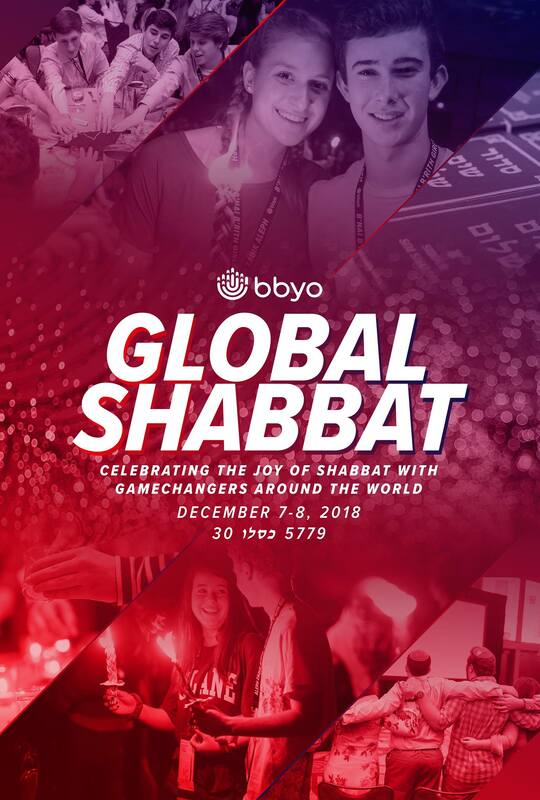 What information can you share about your event to help BBYO build a strong global narrative touting the reach and impact of our Movement's most influential programs? As you gear up for the big day, get ready to EXECUTE. 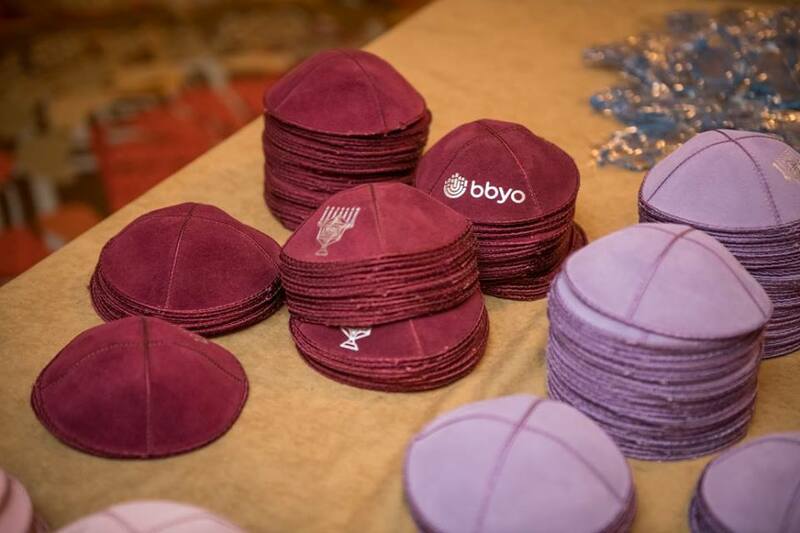 Send out final reminders, walk through the event with your steering committee, prep supplies and swag for distribution, and BBYO-ify your venue. Steward prospects (and members) with intention, and surprise and delight your guests to leave a lasting impression. 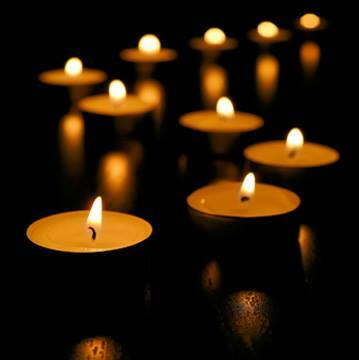 What unanswered questions remain, and how will you address them? How can you use final pre-event reminders and confirmation messages to enhance overall buzz throughout your network? What program moments should be scripted in advance (versus free form), and how should leadership team members plan to handle any issues as they arise? How can you use branding and signage, as well as lighting, A/V, risers or other fun seating options, reserved VIP areas, and other venue elements to bring your space to life and enhance its fullness? What expectations can you set and systems can you put in place to easily identify prospects (and under-active members) to ensure that all new attendees are well taken care of from the time they arrive to when they leave? 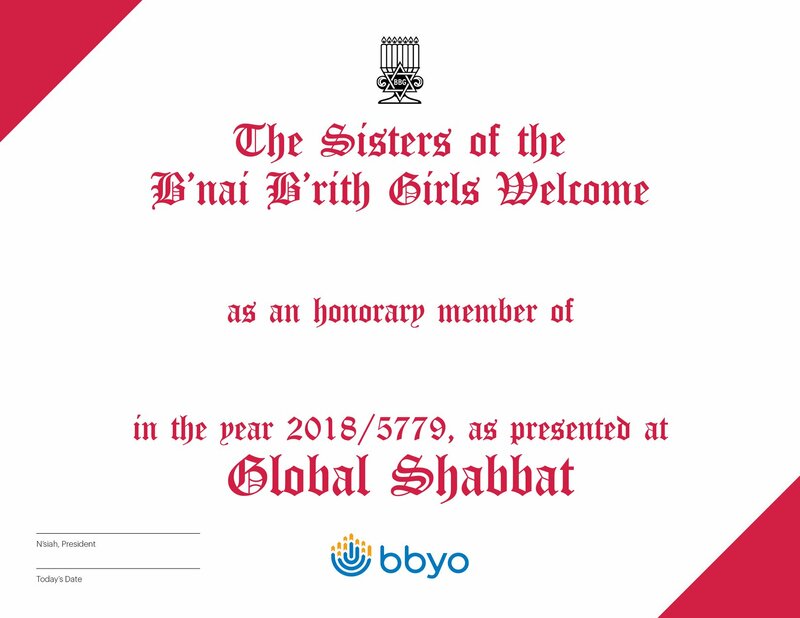 What fun surprises, snacks, and/or other program enhancements can you offer to ensure all attendees leave eager for more BBYO? How will you share upcoming event information so everyone knows what's next? Take advantage of the shared energy and momentum from your event while it's fresh to make sure attendees keep coming back for more. Coordinate an individualized follow-up plan to gather input to inform future programs, say a heartfelt thanks to all involved, and close out the MRIHA model by making the Ask! How can you use technology and/or individualized outreach to gather input from prospects and other attendees to help improve your community's WOW programs in the future? How can you customize available branded templates to personalize your follow-up outreach to all key guest segments (prospects, members, parents, partners, stakeholders, etc.)? 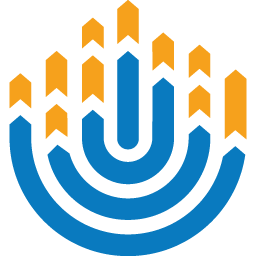 How can you coordinate targeted 'Ask' outreach to invite all prospect attendees to join BBYO in a timely and effective manner? You know an event is going to be successful when you see it everywhere. Utilize these tools and templates to get the word out about your event. 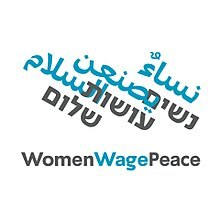 Blast this image on all of your social media channels and be sure your friends share it on their personal accounts. Add your event information in the caption of the image. 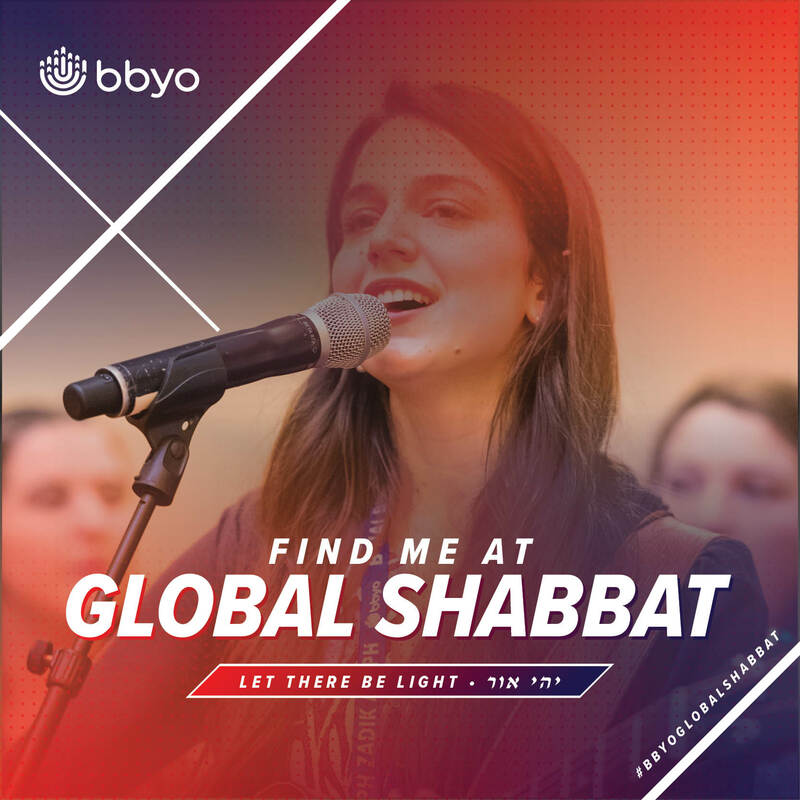 Let your friends know you'll be at Global Shabbat with this awesome profile picture frame. Share the details about your event with this customizable flyer template. This flyer includes a space to upload a headshot for a special guest. Hang these flyers at all of your local hang out spots. Share the details about your event with this customizable flyer template. Hang these flyers at all of your local hang out spots. 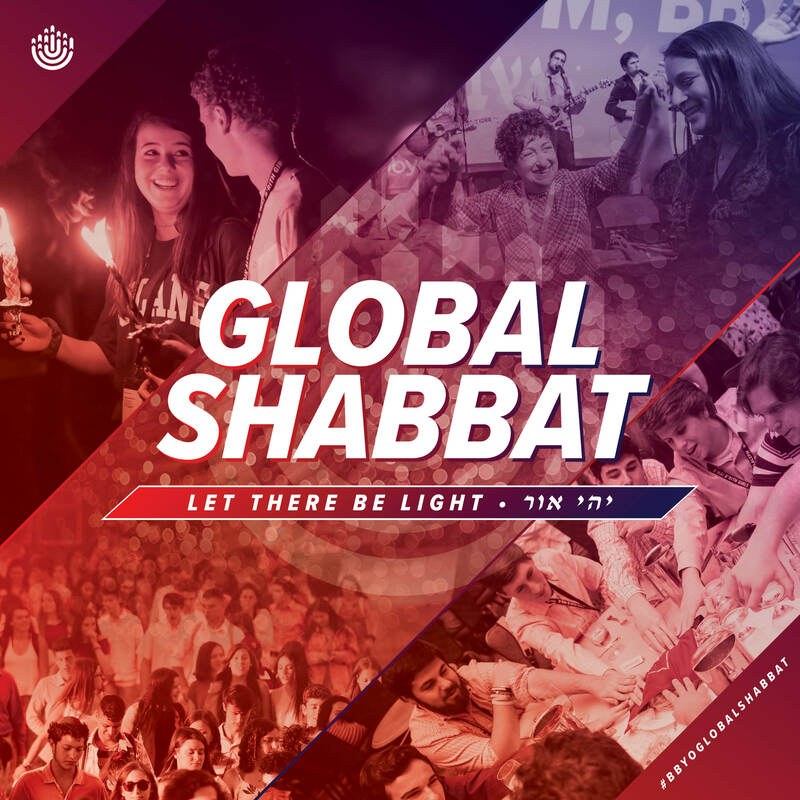 Hang the official Global Shabbat poster all over your city to create buzz and excitement. This poster is also available in a customizable version to add your basic event details. Utilize this letterhead when making formal asks to community partners or guests to join your event. 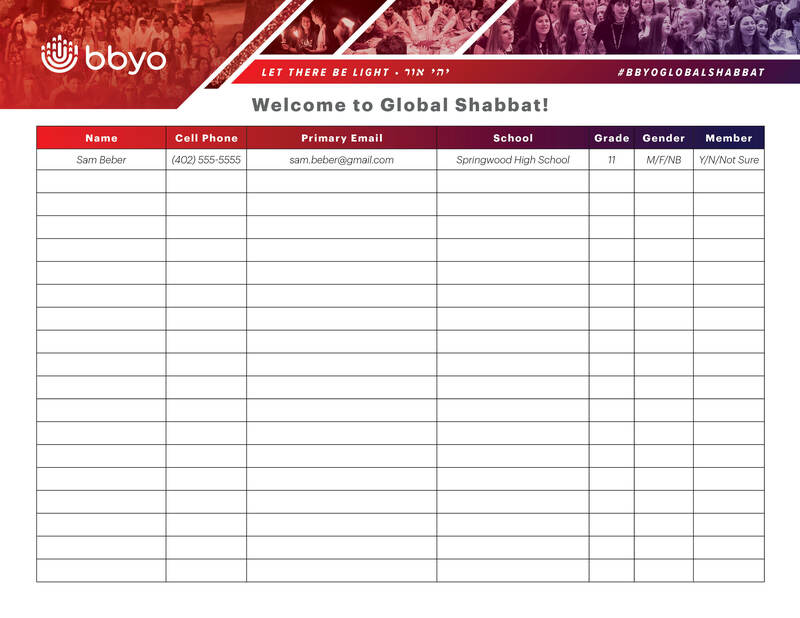 If you're an overachiever, you can put all of your official Global Shabbat program outlines in this document. 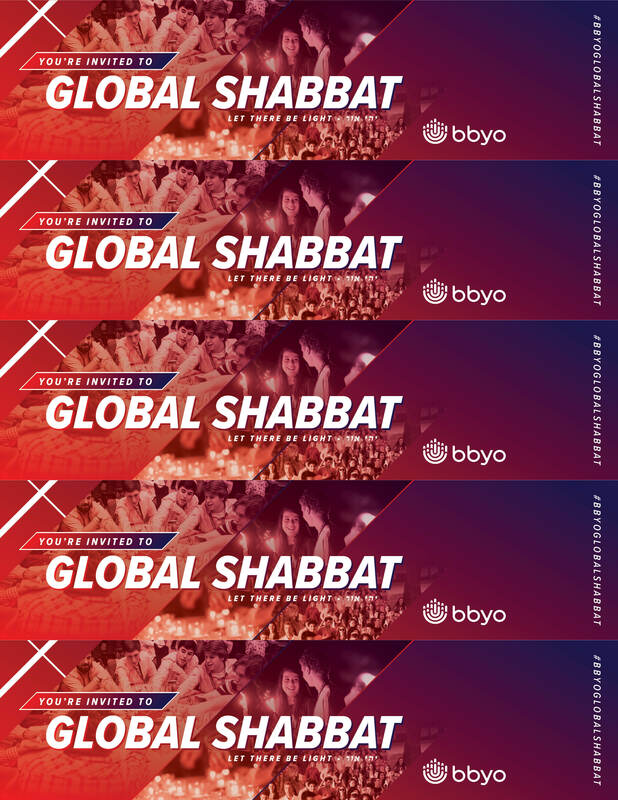 Customize them, cut them up, and hand them out to all of your friends at school, practice, clubs, and more to make sure everyone knows they're invited to your Global Shabbat. Make your Facebook event and personal social media profile look sharp with this event cover photo. When sending your targeting email blasts to your friends, parents, prospects, and community members pop-in these headers and footers. Everyone loves getting something in the mail that feels personal. Reach out to your community with this customizable postcard. Drop this watermark on your photos to promote your event on social media! 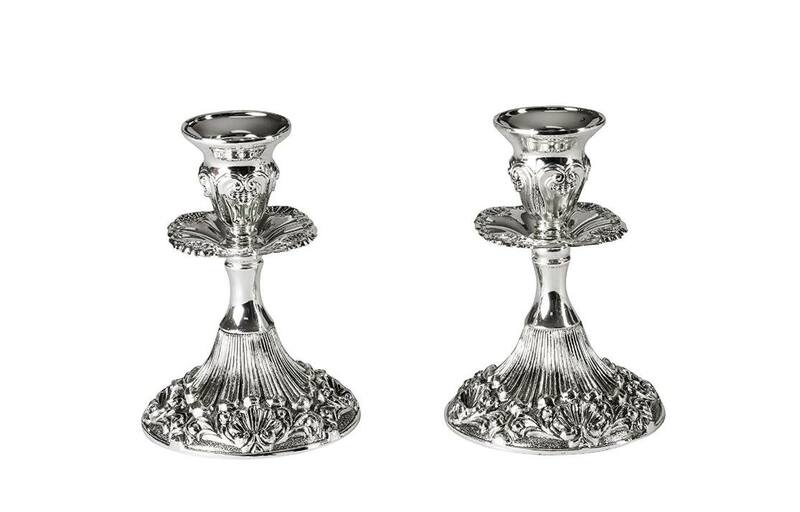 Go all out to make your Global Shabbat space feel special and memorable. Be sure to order these items at least two weeks before your event to avoid any rush fees. Place this board outside of your event entrance so everyone knows they're in the right place. 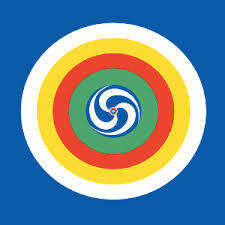 Place this banner at the heart of your event. Be sure it's visible for any special photo moments. Instructions: Select vinyl banners > 13 oz. vinyl banner > 4’Hx8’W. Depending on your space add grommets or pockets for hanging. Grommets are recommended every two feet and work with command hooks. Pockets are great if you already have a banner stand. Upload artwork after you order and be sure to get a proof. Order a step and repeat to make everyone feel like a VIP. Bring additional props and throw a red carpet in front of the step and repeat to really go big. Instructions: Select vinyl banners > 13 oz. vinyl banner > 8’Hx10’W or 8'Hx8'W > 0 grommets, Pockets on top and bottom only (no hems). Upload artwork after you order and be sure to get a proof. Buy a stand for your step and repeat here. Plaster every wall of your event with this poster. If a step and repeat is not in your budget, print out a few dozen of these posters to make a photo wall. on card stock paper or print at local office. We recommend that your event sign-in be online through a form, but we know things happen. Maybe your venue doesn't have WiFi or the sign-in link isn't working. Whatever the case may be, print out a few dozen copies of this sign-in form to ensure you capture the information of everyone at your event. Build a beautiful program book to place on all of your guests seats featuring an evening schedule, special honors, and more. ‍Instructions: Select one of the 'best sellers' and find a size that works for your budget. 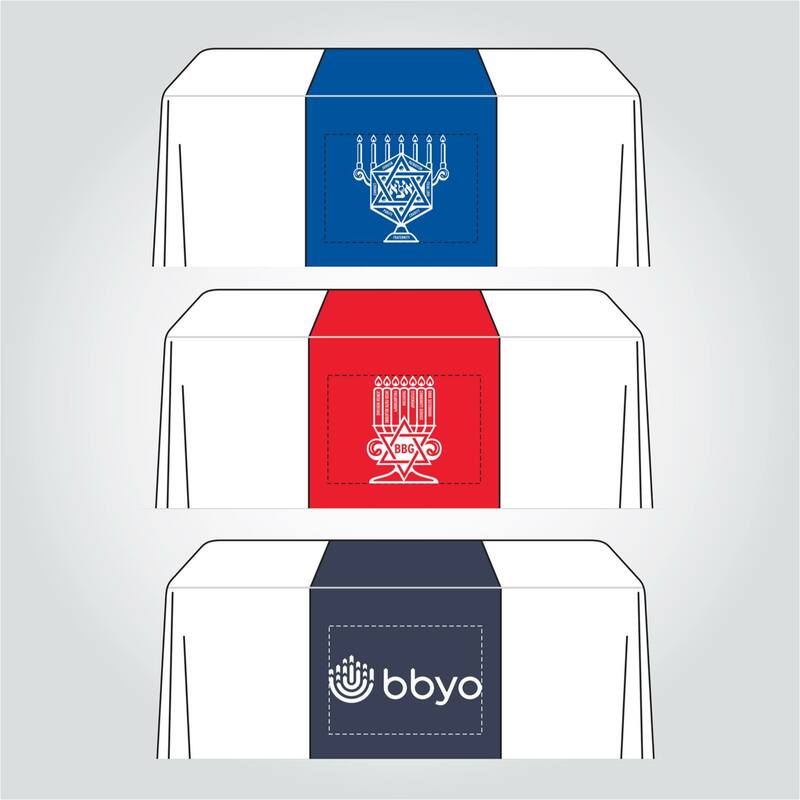 Upload the AZA and BBG seal or BBYO logo for the front. Bring this year’s theme, Let There Be Light, to life by decorating your event space with this collection of notable quotes from some of history’s greatest gamechangers. 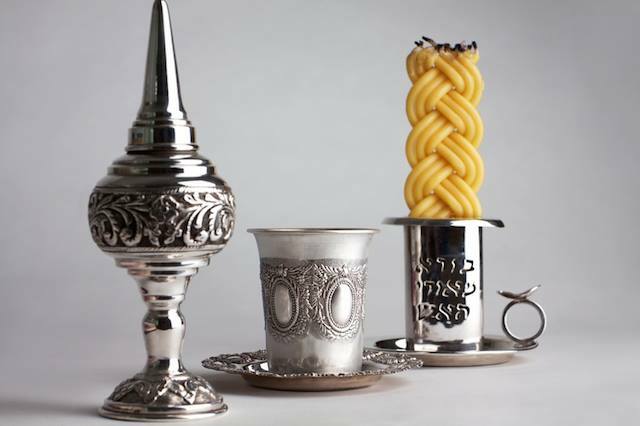 Be sure you have all of the supplies you need to run a Shabbat. 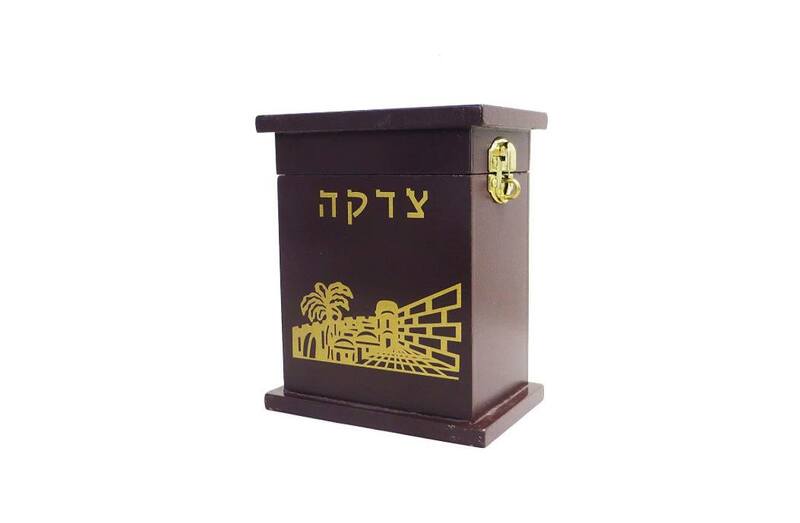 Many of these general Judaic pieces can be borrowed from family members or synagogues if you ask, but feel free to order a set for your chapter too! Be sure to order these items at least two weeks before your event to avoid any rush fees. 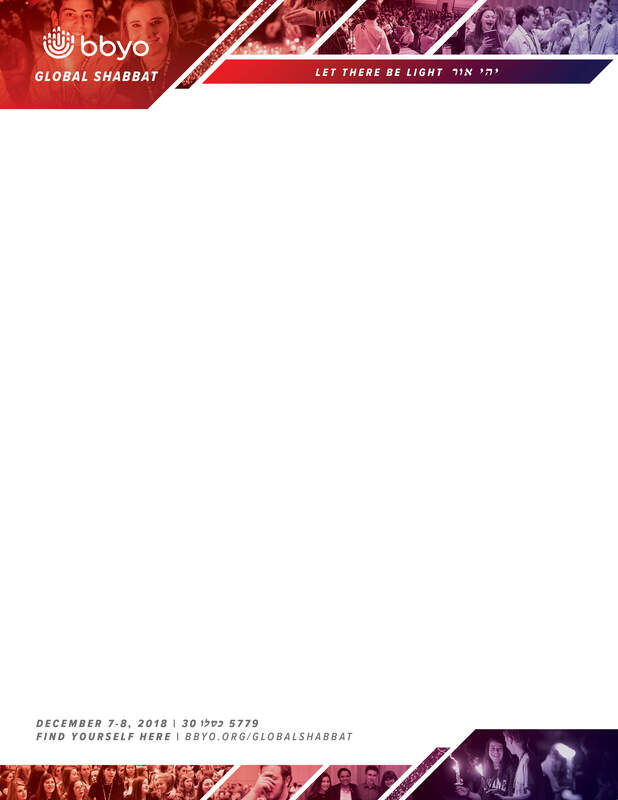 Instructions: Upload artwork and order a 14'x14' bandana. Try ordering an assortment of colors to enhance your space. 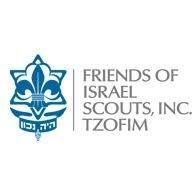 Instructions: Add the AZA or BBYO seals or BBYO logo to some custom made kippot for the big weekend. Minimum order of 60. These take 2-4 weeks to produce. 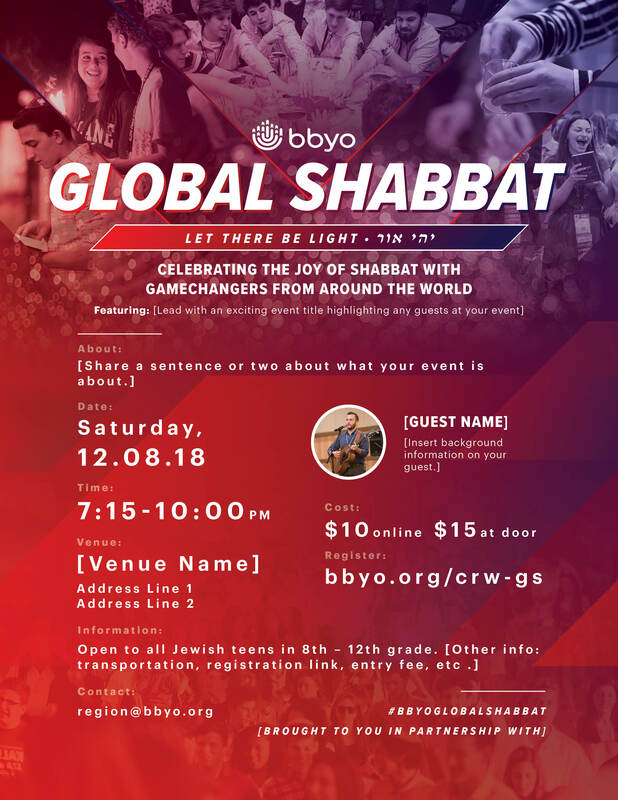 Learn the basics of Global Shabbat and how you can start planning an event to 'WOW' your community. 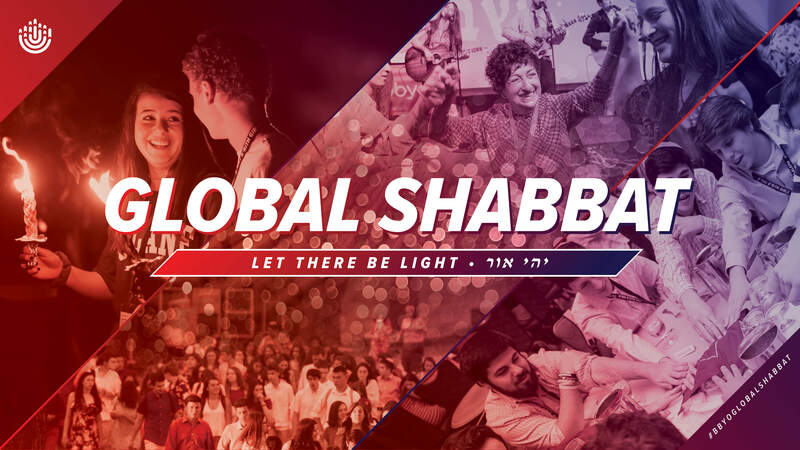 Global Shabbat makes us feel like a Movement because it's happening in hundreds of cities around the world. Use this script to open and close your events, so participants feel a part of something bigger. 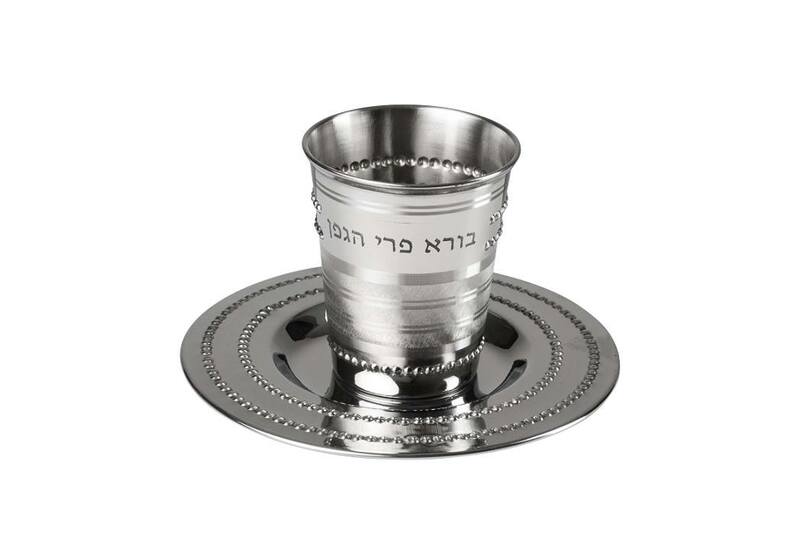 Place this booklet on your Shabbat dinner tables to guests can follow along with the beautiful prayers of Shabbat. 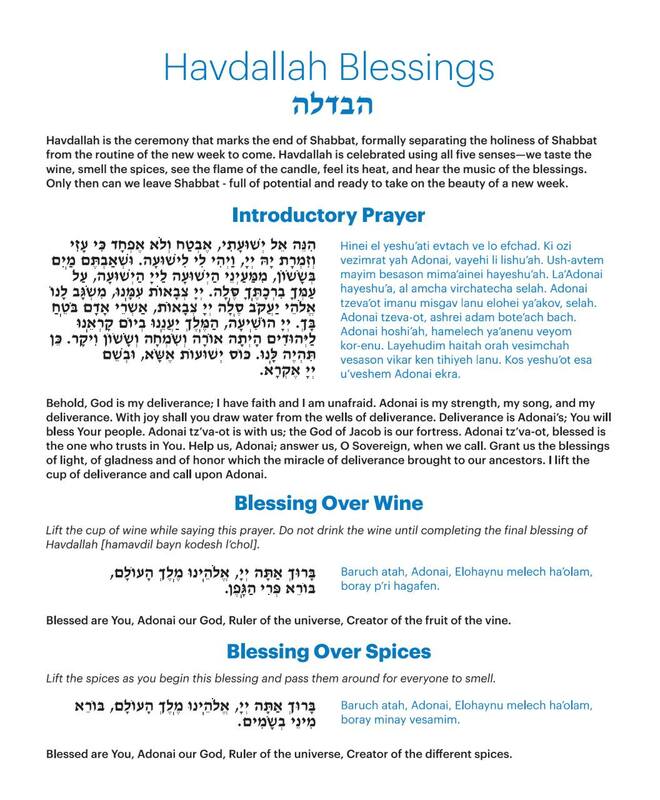 Use this Havdallah Card so everyone can participate in the prayers! Havdallah is best when you can hear everyone's voice. 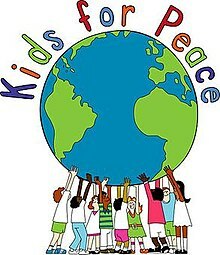 Part of what makes Global Shabbat so special is the amazing guests brought in to enhance the evening. 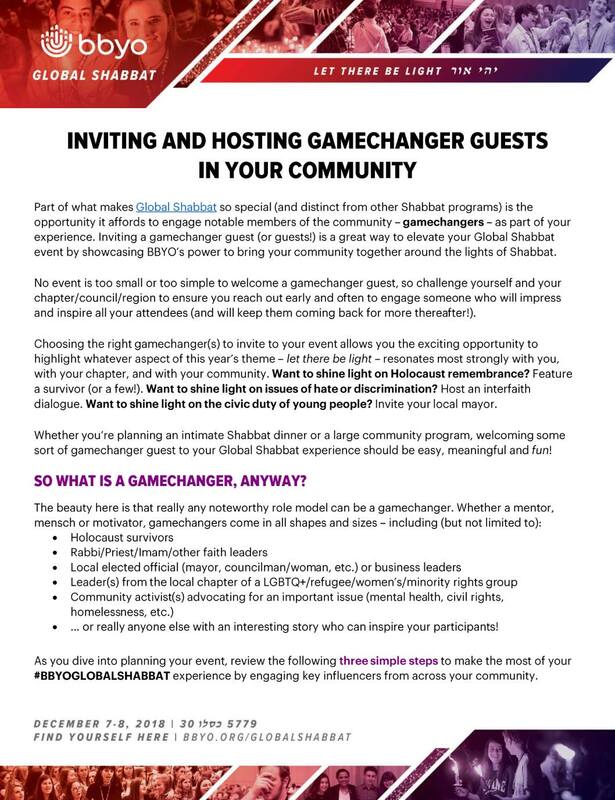 Learn how to invite a gamechanger guest to your event. 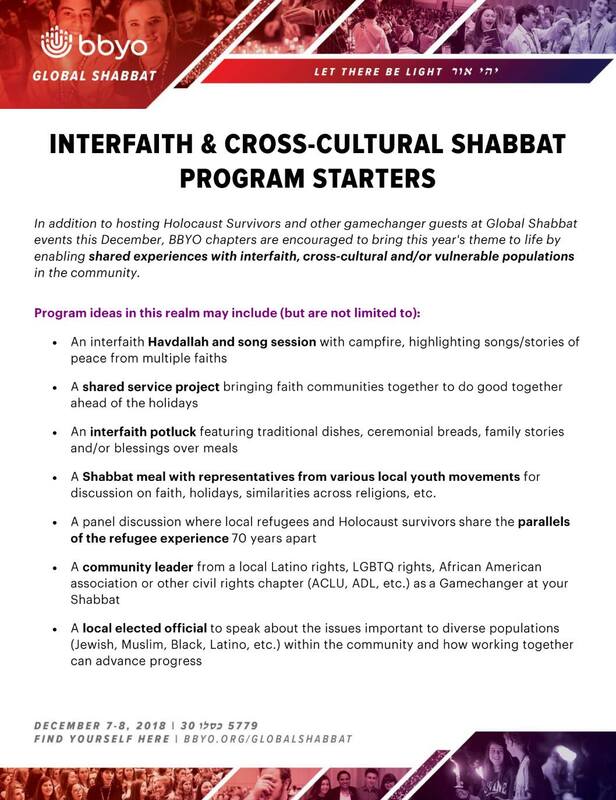 We encourage chapters and communities to bring the theme of Global Shabbat to life by sharing experiences with interfaith, cross-cultural, and/or vulnerable populations in the community. Get some ideas for how to bridge communities together. If you are inducting any gamechangers (special guests) into AZA or BBG at your Global Shabbat experience, print out an official certificate to give them during or after the ceremony. 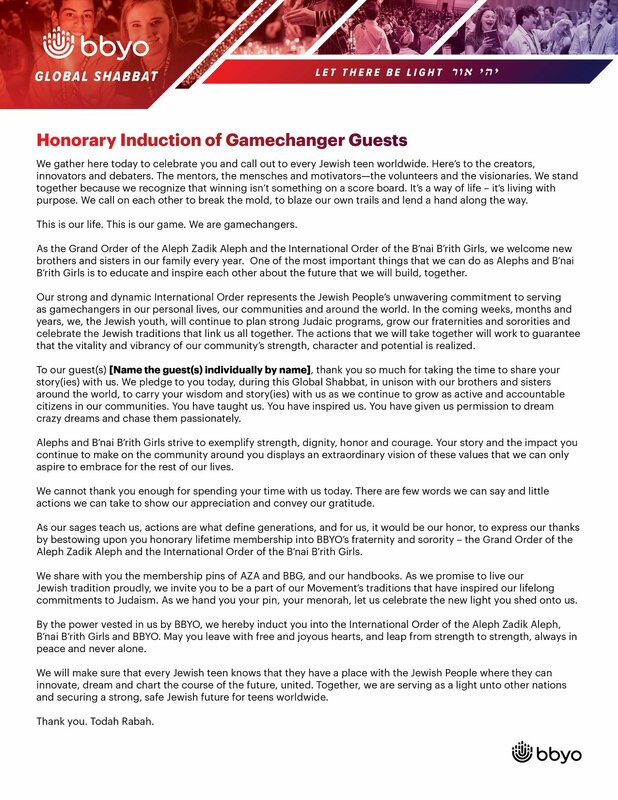 Use this script for the honorary inductions ceremony for AZA and BBG. 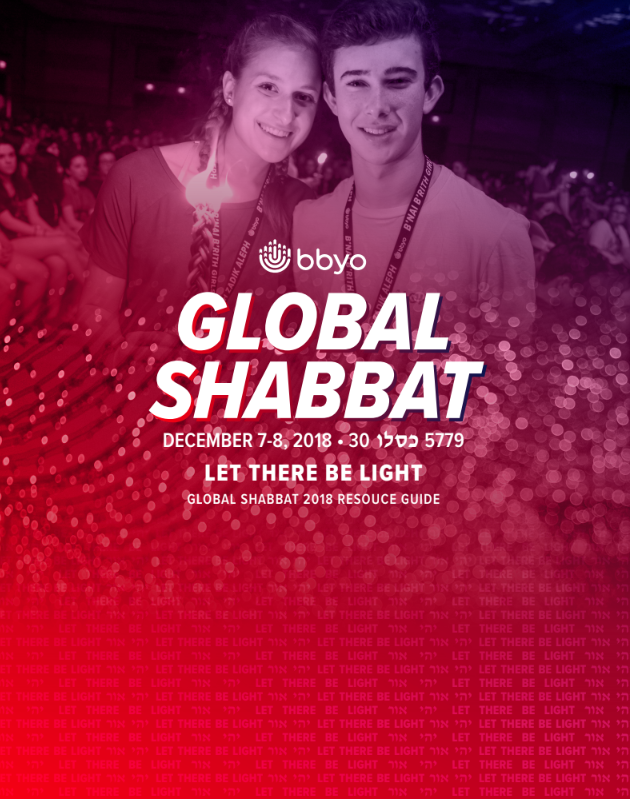 Get program ideas for how to bring to life this year's Global Shabbat theme: Let There Be Light. 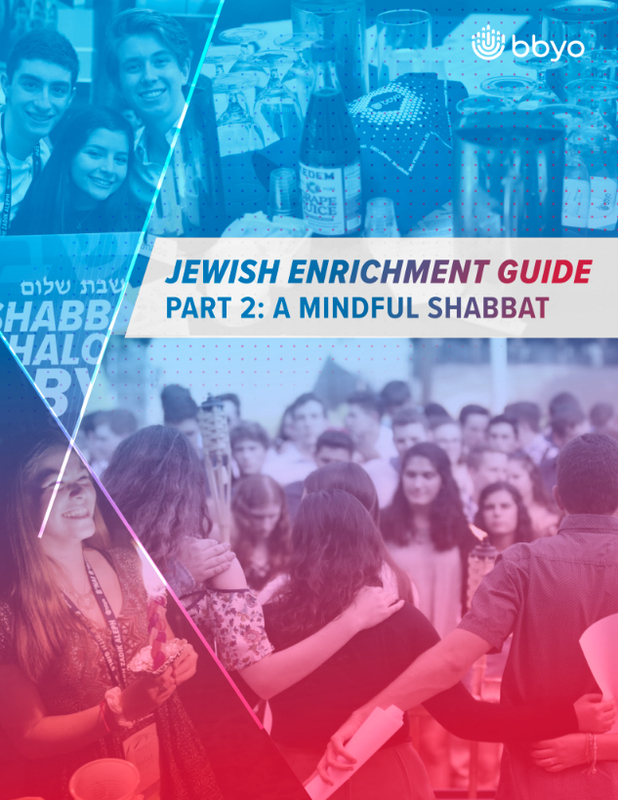 This guide is intended to serve as a resource to enrich Shabbat experiences with additional Jewish content and ideas. 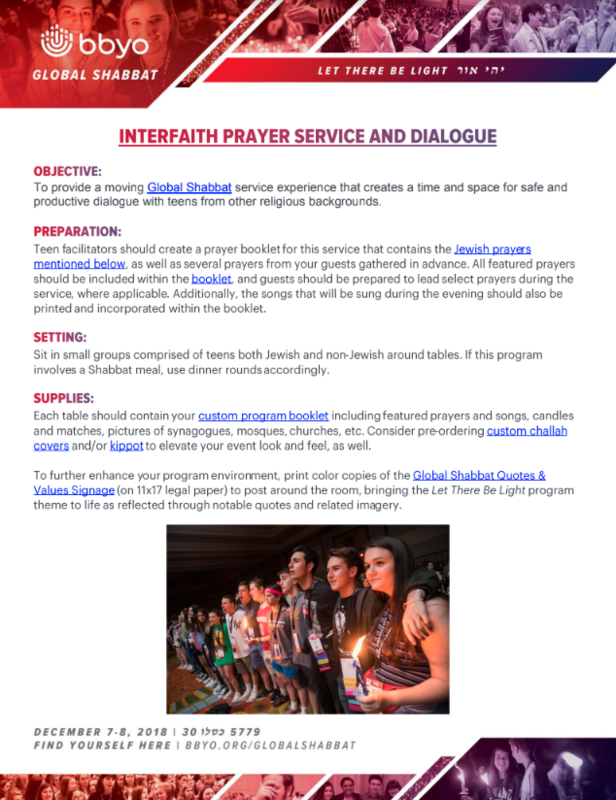 This guide will provide a moving Global Shabbat service experience that creates a time and space for safe and productive dialogue with teens from other religious backgrounds. 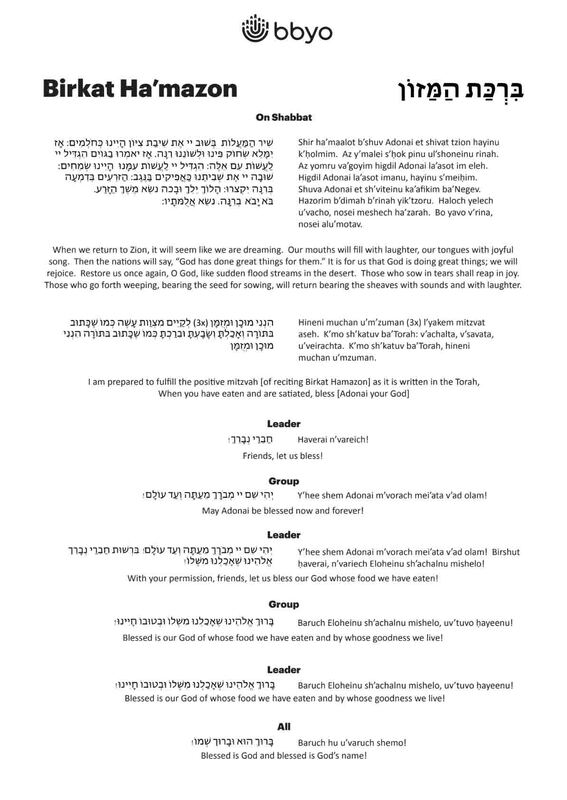 Print these cards for all tables so everyone is able to follow along and participate in the prayer after each meal. Thank the people who made your event happen and invite everyone to come back for your next community event! Don't forget to thank all of the people, partners and planners who helped make your event possible. A handwritten note means the world. Hand these out at the end of your event to invite your friends to the next big thing (hint: Spring Kickoff or Winter Convention). These are customizable for you to share information about your next event. printing company) a 3.5"x2" full-color business card. 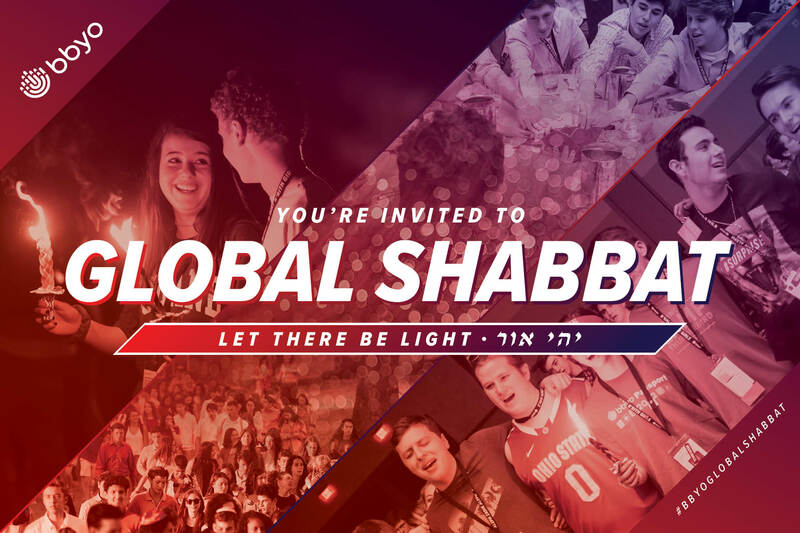 Want to share the news about your local or regional Global Shabbat event? Edit this customizable press release template to showcase your program and send out to local media contacts ASAP. 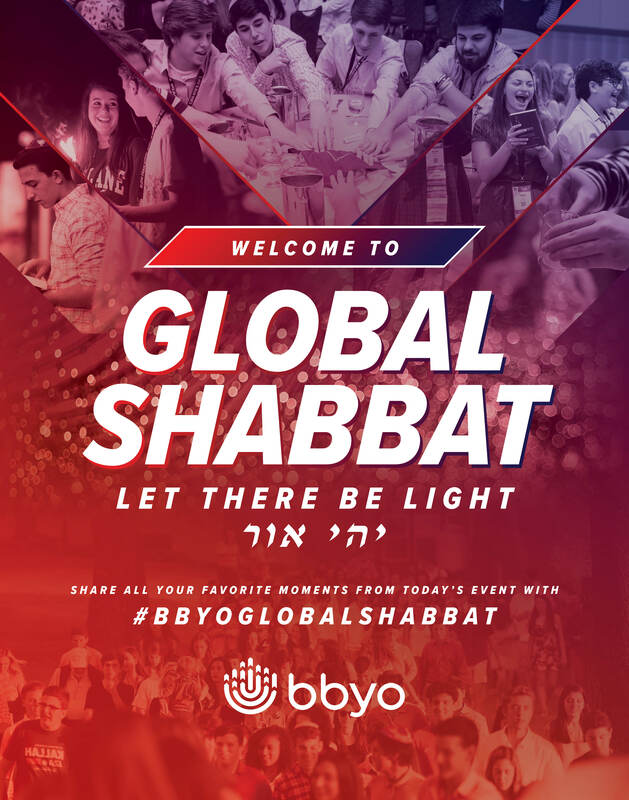 Share the success of your Global Shabbat experience and make sure to tag @bbyoinsider on social, too, so we can help spread the word! 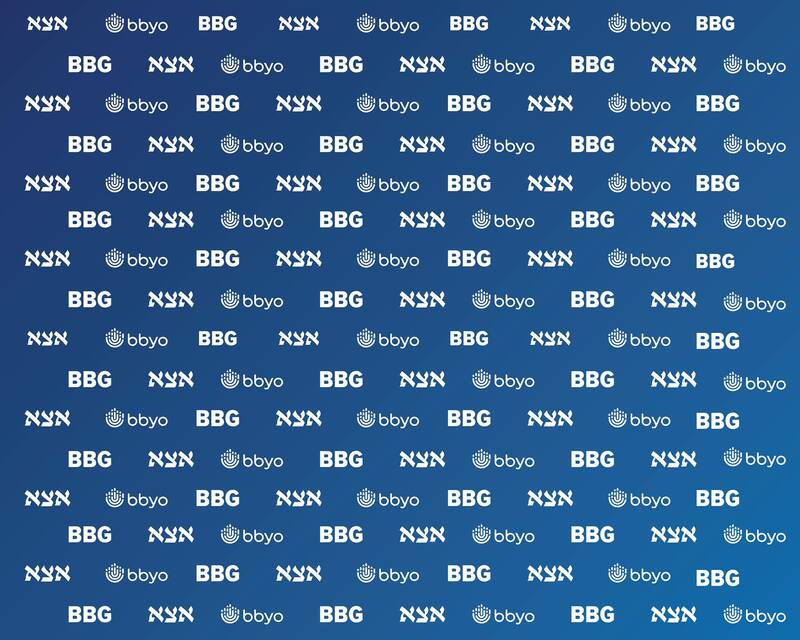 Share all of your Kickoff posts with the hashtag #BBYOKickoff to showcase all of the incredible events happening around the world. Maybe if you're lucky you'll get a shout out from @BBYOInsider.